It is easy to replace the cabin air filter in the 2017 Ford Edge. We have the Ford Edge Sport model, which is an awesome ride! The cabin air filter is located behind the glove box. You’ll follow a three step process to replace the filter. Step 1: Open the glove box and un-hook the lever on the ride side of the glove box. Hold the lever, and gently push the glove box in the close direction; there is a small hole and a bigger hole the locks the glove box to the lever. Although you can’t see it, you’ll need to align the lever connecting pin with the bigger hole to remove the lever. Pull the lever toward the passenger door gently; if it doesn’t come out, you don’t have it aligned with the bigger hole. Step 2: Lower the glove box. In the back near the top, you’ll see two screws on the filter box (one on the right and one on the left). Remove those two screws and then un-clip the air filter cover (one clip on the right and one on the left). Pull the box cover up and you’ll see the cabin air filter. Step 3: Replace the cabin air filter. Reverse the process and you’re done! 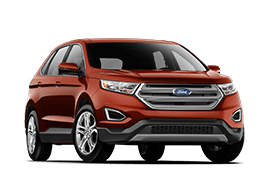 Watch the video below, which provides the visuals for replacing the cabin air filter in the 2017 Ford Edge.